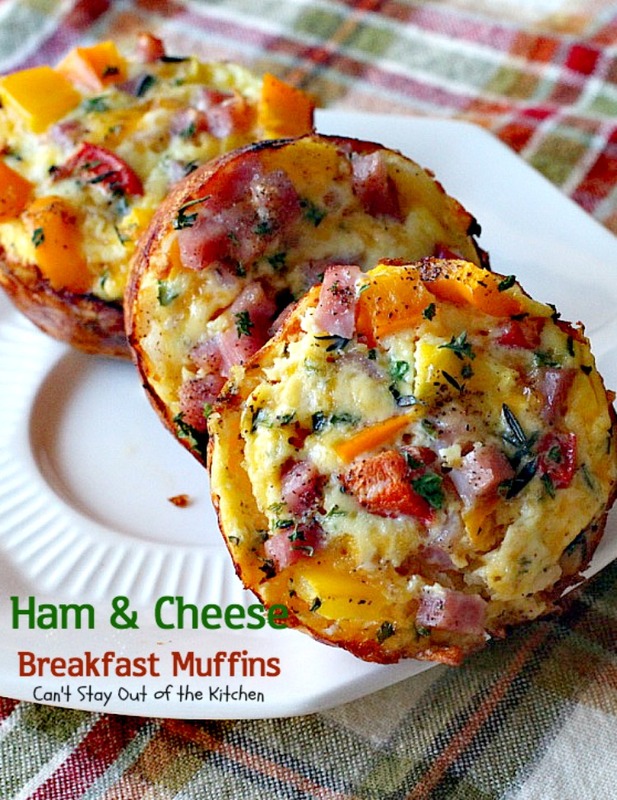 Ham and Cheese Breakfast Muffins are so wonderful. 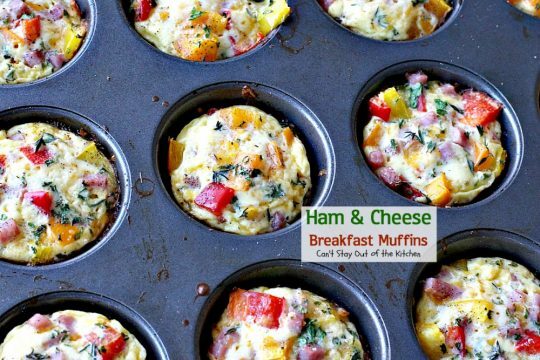 Because this recipe makes 24 muffins, you can make up a batch and then heat them up for breakfast on the go for the rest of the week! 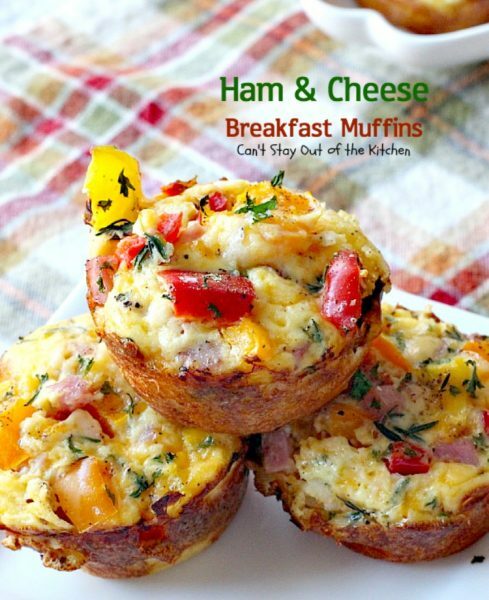 These delectable muffins start with cheesy potato crusts. After the crusts are baked, the ham, egg and cheese mixture is added. My muffins included three kinds of bell peppers and they were seasoned with thyme, parsley, salt and pepper. 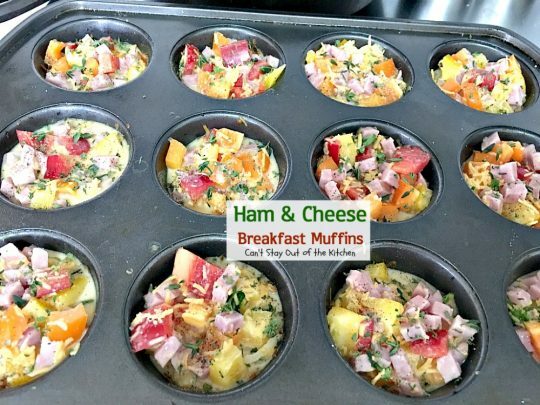 I thought Ham and Cheese Breakfast Muffins turned out incredibly delicious. I based these muffins off of my Breakfast Muffins recipe. Instead of bacon as the meat, I switched it out for ham. I also increased the seasonings. These muffins are savory, hearty, filling and completely satisfying. One or two of them will have you completely filled up! 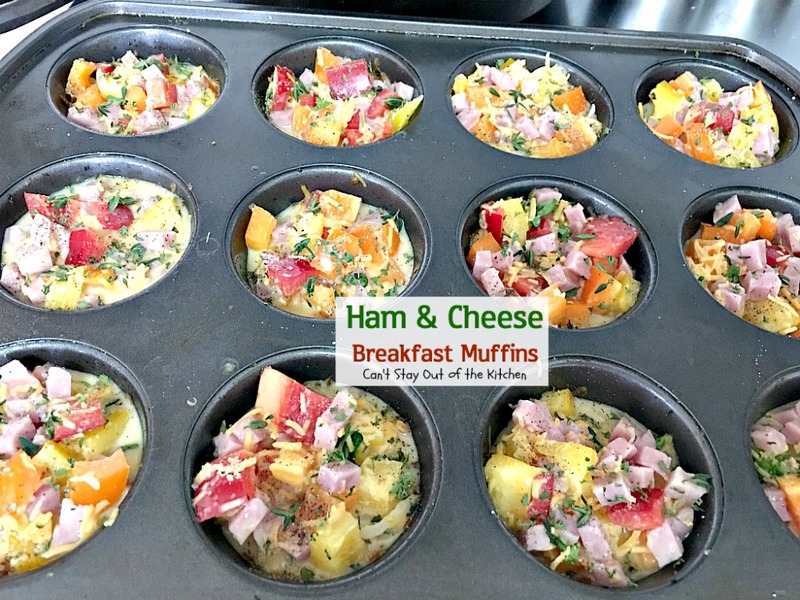 I made a batch of these breakfast muffins a few weeks ago and, because there’s only two of us (and the recipe makes 24), we served these muffins for breakfast for several days. It was so easy. They taste great heated up in the microwave. 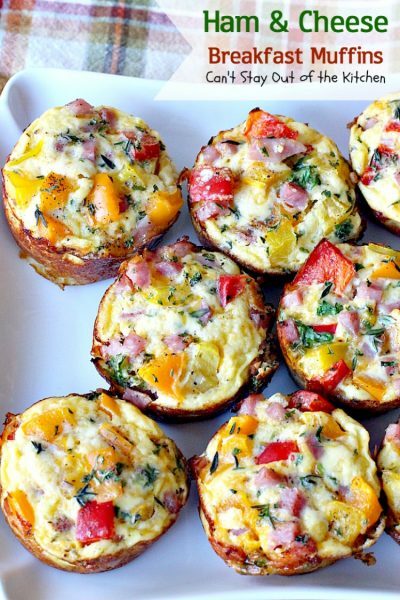 Serve with fruit and you have a delicious gluten free breakfast. If you’re looking for a great item for a holiday or country breakfast or brunch menu, give Ham and Cheese Breakfast Muffins a go. 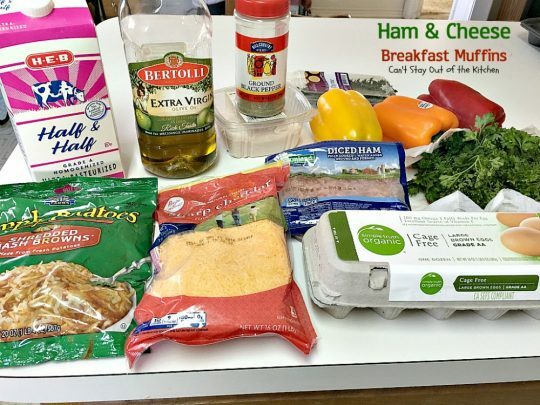 They’re seasoned to perfection and if you like a ham and egg breakfast, these muffins are something special. 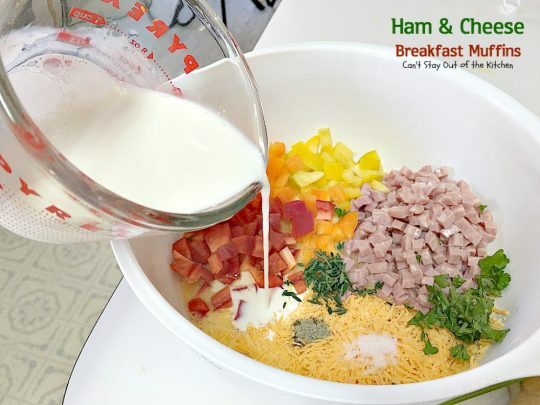 This lovely recipe is featured at All Free Casserole Recipes here. 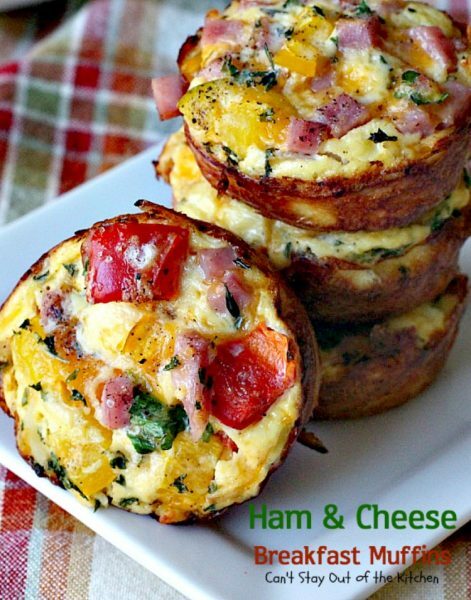 Ham and Cheese Breakfast Muffins are so incredibly good. These muffins are great to heat up for breakfasts on the run. 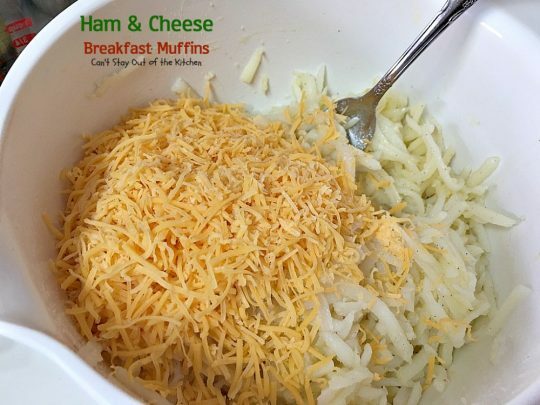 Every bite of Ham and Cheese Breakfast Muffins is so hearty and filling. 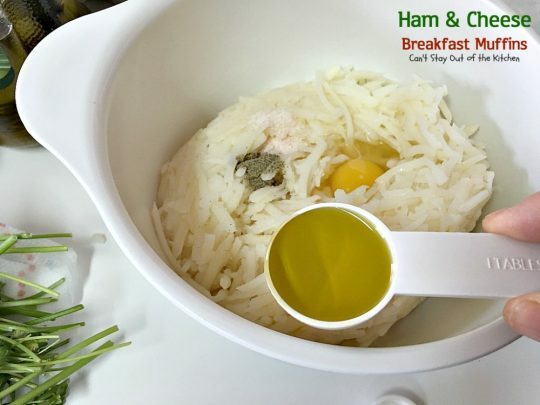 Place hash browns in a bowl. Add salt, pepper, an egg and olive oil. Add shredded sharp cheddar cheese. Spray 24 muffin tins with cooking spray. Divide potato mixture between the 24 tins. Bake at 400 for about 15 minutes until potatoes are crispy. Meanwhile, make egg mixture. Whisk eggs. Add ham, cheese, bell peppers, seasonings and half-and-half cream. Divide egg mixture between 24 muffin tins. Bake at 400 an additional 15 minutes or until custard is set. 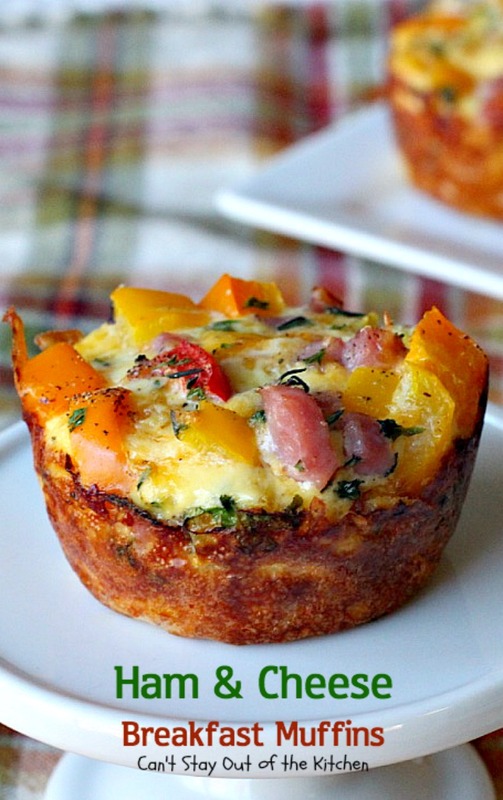 The seasonings and bell peppers add a delicious savory flavor to these muffins. 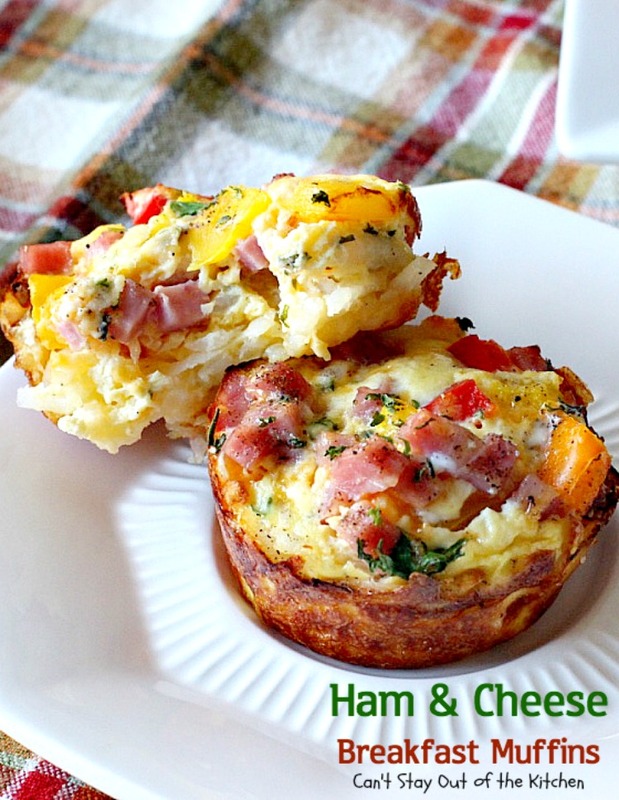 Ham and Cheese Breakfast Muffins are a scrumptious treat that’s great for holiday breakfasts. These scrumptious breakfast muffins are filled with ham, cheese, eggs, bell peppers and delicious seasonings in a hash brown potato crust. Gluten free. Spray 24 muffin tins with cooking spray. 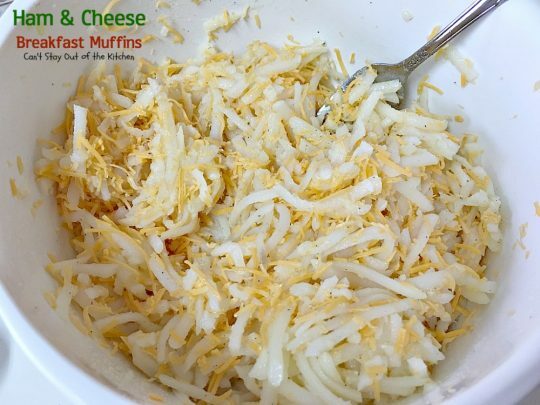 Combine one egg with hash browns, olive oil, 1 cup cheese and half each of the salt and pepper. Divide mixture evenly between 24 muffin tins and press down. Bake at 400° about 10-15 minutes or until potatoes are crispy. Meanwhile, whisk remaining 8 eggs in a large mixing bowl. 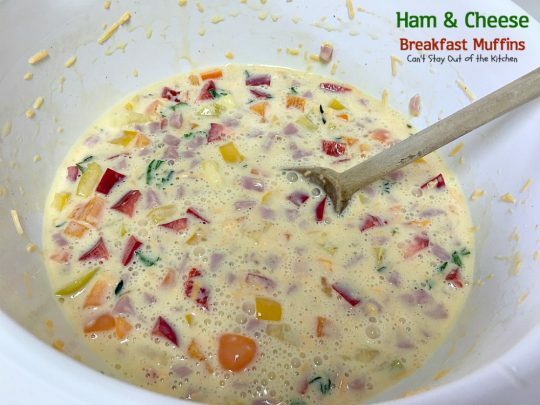 Add remaining 1 cup cheese, remaining salt and pepper, ham, red, yellow and orange bell peppers, 1 tsp. fresh thyme, 1 tsp. fresh parsley and half-and-half. 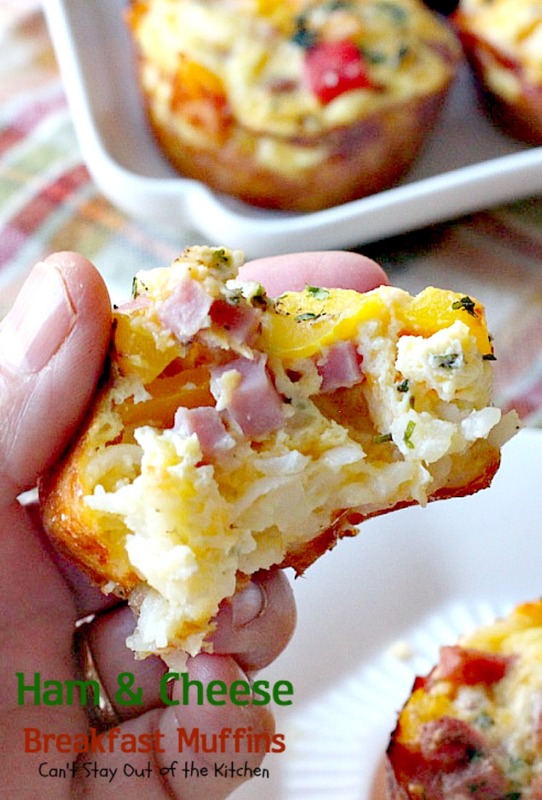 Pour egg-bacon mixture evenly over each potato muffin crust. Sprinkle with additional salt, pepper, thyme and parsley, if desired. Bake an additional 10-15 minutes or until eggs are cooked through. 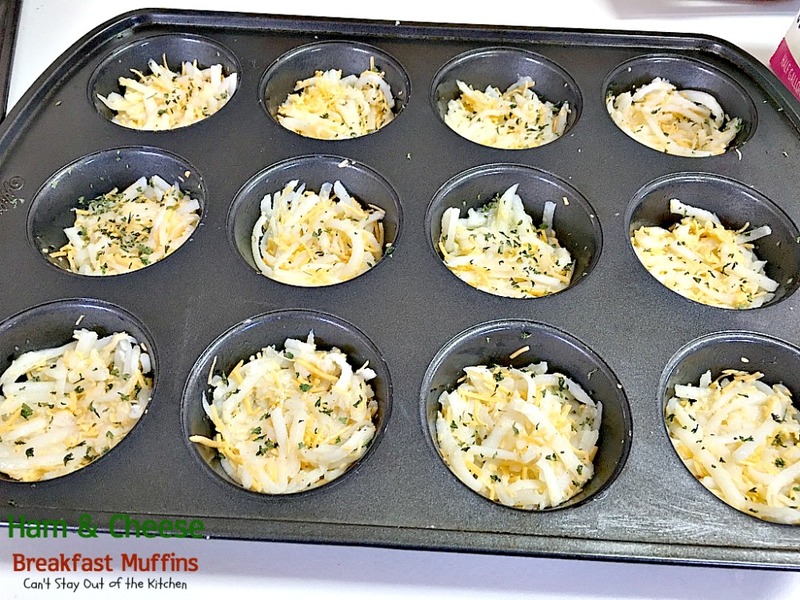 Allow muffins to cool in muffin tins about 5 minutes before removing. NOTE: The secret to getting the muffins out of the pan easily is to spray generously with cooking spray or grease really well. This is extremely important. 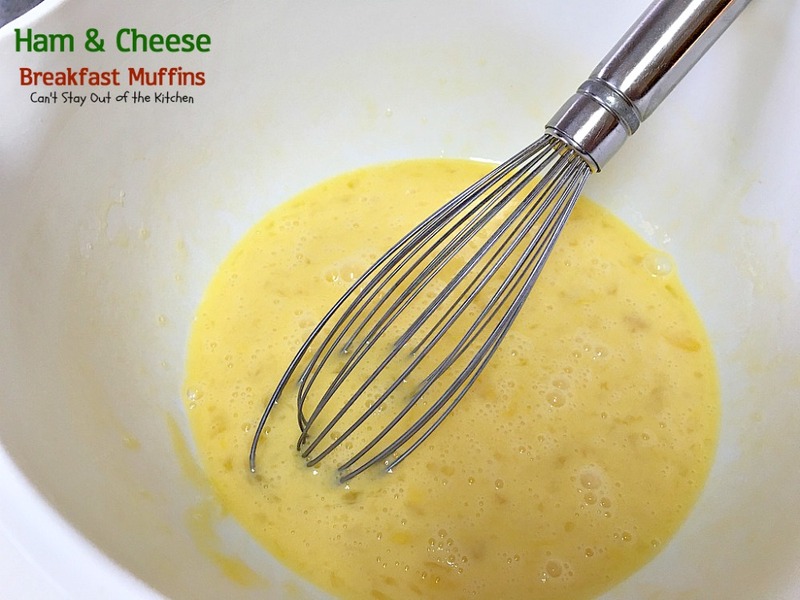 Then use a very narrow rubber spatula to gently cut between the outside of the muffin and the tin. The rubber spatula should be able to go easily between the tin and the muffin all the way around. Then, using the rubber spatula, gently press the rubber spatula against the sides all the way to the bottom of the tin pulling the muffin up slightly all around the circumference of the bottom of the muffin tin to make sure none of the crust adheres to the bottom or sides of the tins. Then lift out muffin. NOTE: If you have to use a 28-oz. bag Ore-Ida frozen shredded hash browns, thawed, because you can't find the fresh potatoes, you will need to pat dry the potatoes before using. Otherwise, they will have too much moisture and the potatoes will stick to the sides of the muffin tin when removing muffins. Ham and Cheese Breakfast Muffins are gluten free. These muffins are quite substantial. You’ll be completely full after a couple of these. Time to make these today! Can’t wait to prepare & cook these for quickie breakfast/lunch for hubby at work… they sound nutritious, look delicious and I am sure, they taste yummy!! He just needs to pop in microwave for 15-20 Seconds, right? Hi Hope. Yes, 15-20 seconds if refrigerated. If frozen it will probably take between 30-45 seconds. Enjoy. Looks way yummy! Thanks Teresa! Pinned! Thanks, Kim. 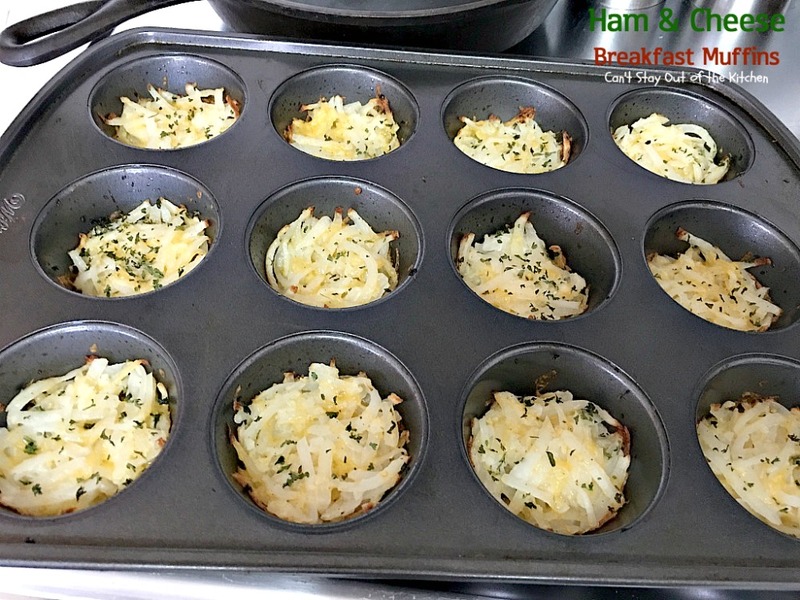 These are fabulous for special occasion breakfasts or to make and have on your way to work for breakfast because they heat up so easily! Enjoy. I love how colorful these are, Teresa! The taste must be wonderful with the bell pepper and ham. Pinning these to try! I think you’ll love these, Shari. I seasoned them with thyme and parsley which really added great flavor. They’re great to heat up for leftovers, too.